I close out National Poetry Month with United States Poet Laureate Natasha Trethewey reading "Benediction", a poem she wrote the day her brother was released from prison after serving time for a drug offense. The reading was given at King County Juvenile Detention Center, which Trethewey and arts correspondent Jeffrey Brown visited for their "Where Poetry Lives" series for PBS NewsHour. Read Trethewey's "Poet's Notebook: Difficult Knowledge" about her visit. as you enter this shelter of blossoms. I wrote this poem in November, 2013, for Hawak Kamay: Poems for the Philippines after Haiyan, a FaceBook group and a disaster-relief poetry project initiated by Juan Felipe Herrera, Poet Laureate of California, to which poets offer poems of comfort, healing, and inspiration. (In Filipino, "hawak kamay" means "to hold hands".) This is the poem's first appearance on my blog. failure into an irreplaceable advantage. 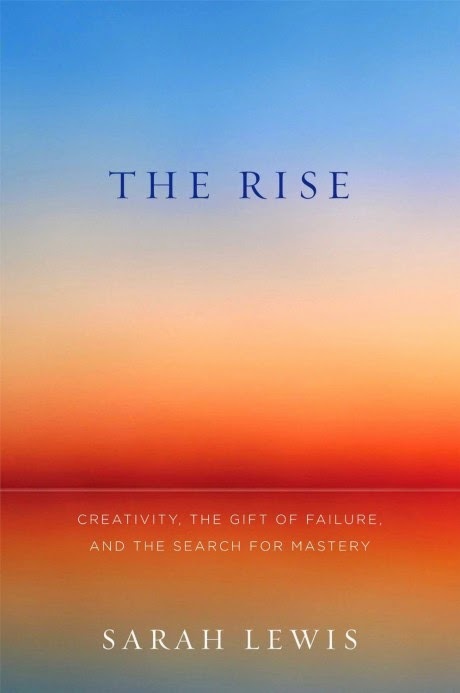 Sarah Lewis, a self-confessed "contrarian", calls her well-written book The Rise: Creativity, The Gift of Failure, and the Search for Mastery (Simon and Schuster, 2014) "the biography of an idea". That idea is that setbacks are hugely important to our enduring capacity "to create something so iconic out of what seems like nothing." Failure, it must be stated, is not the opposite of success, and Lewis aims to explain why. Supporting her thesis, Lewis identifies four characteristics of people most likely to "rise": "the power of surrender, the propulsion of the "near win", the critical role of play in achieving innovation, and the importance of grit and the creative process". (p. 11) That third factor, play, cannot be over-emphasized. Two noteworthy chapters in Lewis's book are "The Deliberate Amateur" and "The Grit of the Arts"; either offers plenty for discussion. Drawing on numerous studies, Lewis is especially articulate about the role of play in the creative process, as well as "grit" — that is, showing up over and over and over. "'Innovation is an outcome. Play is a state of mind. Innovation is often what we get when we play', [Ivy] Ross believes." (p. 159) Ivy Ross is chief marketing officer at Art.com. Overall, I find Lewis to be a thoughtful and open-minded writer who is not concerned to prescribe what we must do or to formulate a set of lessons. Her perspective is that no matter how dubious our vision or pursuit may seem, each of us has within the power to "see up and out of failures", and that what we derive from such experiences in fact points us to "an indispensable way out from intractable paths." When we go down, she strongly intimates, we indeed have the capacity to rise stronger. Also see this second trailer. Lewis also has presented at TED. Watch her TEDTalk, "Embrace the Near Win" (2014). A resident of New York City, Lewis also is a curator and writer on art. She will receive a doctorate this year from Yale University. but it's also music. . . .
Today's short comes from the UC Berkeley Series "Lunch Poems". The video, from 2012, features Natasha Trethewey, Poet Laureate Consultant in Poetry, 2012-2014. A recipient of the 2007 Pulitzer Prize (for Native Guard) and numerous other awards, Trethewey is the author, most recently, of Thrall (Houghton Miffin Harcourt, 2012). ✦ The intricately carved 3D book art of Kerry Miller is among the most beautiful I've seen. When you view Miller's exquisite portfolio, you'll enter the world of the artist's imagination. Miller most recently exhibited her creations at SCOPE New York. She is represented by Lawrence Cantor Fine Art, Los Angeles. ✦ Looking for information on principles of fair use? See "Intellectual Property and the Arts" on the College Art Association's Website. With funding from the Mellon and Kress foundations, the CCA is creating a "Code of Best Practices for Fair Use in the Creation and Curation of Artworks and Scholarly Publishing in the Visual Arts". A report on the issues has been completed. ✦ In "My favourite work" series, available via The Guardian, curators and gallery directors introduced via video and explained their favorite works at the Adelaide Biennial 2014 (March 1 - May 11, 2014). One of the most interesting presentations was of Julia deVille's Phantasmagoria. The fascinating and thought-provoking artist is a taxidermist who incorporates "ethically sourced" animals in her work, as well as a jeweler. ✦ Digital artist, designer, and programmer Daniel Brown of London has created an unusually eye-catching series, "On Growth and Form", comprising custom flowers that can be output to different media. Visit Brown's Website and then scroll the page to see examples of his beautiful flowers. Also check in at Brown's archive of interactive and generative projects Play-Create. Several large images of Brown's flowers also are featured at Art is a Way. ✭ Bo Bartlett and Betsy Eby are the subject of "Paintings by Bo Bartlett and Betsy Eby" at Morris Museum of Art, Augusta, Georgia. Bartlett and Eby, who are married, live a portion of the year in Georgia and have studios in Maine and Georgia. Bartlett is a realist, while Eby works in encaustic. Their work is on view through June 1. Also see the video "Betsy Eby: Painting with Fire" at Vimeo. Eby also is the subject of Marquand Books' Betsy Eby. Read Liz Arnold's interview "Painting with Fire: A Visit with Betsy Eby" at The Paris Review Daily. ✭ St. Louis Art Museum is host to "Anything but Civil: Kara Walker's Vision of the Old South". Continuing through August 10, the exhibition focuses on Walker's 15-piece portfolio of 2005 in which the artist printed her cut-out silhouettes over enlarged reproductions from Harper's Pictorial History of the Civil War. Walker, whose work I've seen, is provocative, thought-provoking, and unsparing in her depiction of the truth of slavery in the American South. ✭ Mississippi Museum of Art, in Jackson, continues through May 18 its exhibition "The Slave Series: Quilts by Gwendolyn A. Magee". An award-winning artist (among other honors, she was a 2007 USA Ford Fellow), Magee (1943-2011) was a masterful quilter who used applique, embroidery, jewelry and other embellishments, and layered fabrics to tells the brutal practice and history of slavery. Out of ugliness was profound beauty created. The quilts in the show all come from the permanent collection of the museum, which in 2004 published Journey of the Spirit: The Art of Gwendolyn A. Magee. View Magee's portfolio of narrative, abstract, figurative, and pieced quilts and read her answers to questions about quilting in the FAQ section of the Magee Website. ✭ Northern Illinois Art Museum, in DeKalb, continues through May 23 its group exhibition "Hoarding, Amassing, and Excess", described as an exploration of "psychological, sociological, and artistic impulses for accumulation, horror vacui, berserk collection, and excessive mark making." In addition, the Art 656 Museum Studies project is presenting through May 23 "Looting, Hoarding, Collecting. . .", on both the historic and contemporary issues of looting and repatriating museum collections. Read "Who are you calling a packrat?" in NIU Today for more information about the shows and participating artists. ✭ Brooklyn's Domino Sugar Refinery becomes the site May 10 of Kara Walker's first large-scale public project: "A Subtlety, The Marvelous Sugar Baby", described as "An Homage to the unpaid and overworked Artisans who have refined our Sweet tastes from the cane fields to the Kitchens of the New World on the Occasion of the demolition of the Domino Sugar Refining Plant". Presented by Creative Time, the installation will encompass the 90,000-square-foot plant. Recipient of a MacArthur Foundation "Genius Grant", the artist will be honored during Creative Time's spring gala. Today, Thursday's Three offers three Web resources on poetry. ✭ Poetry Flash ~ This site describes itself as a "Literary Review & Calendar for the West" and an "independent voice" for poets, poetry, and creative writing. Anytime you're headed to the Left Coast or just want to catch up on activities elsewhere, you might want to stop in and take stock of the many essays, reviews, readings, awards ceremonies, festivals, and other events, and poems to be found here. ✭ The Cultural Society ~ Here you'll find the work of contemporary poets and news of the publication of poetry collections. Based in Brooklyn, New York, The Cultural Society makes quarterly or semi-annual updates to its site and publishes four book titles per year. It also offers audio recordings. ✭ Poetry Center Digital Archive ~ The digital archive of the Poetry Center & American Poetry Archives provides free public access to original audio and video recordings dating from 1954 to the present. This spring it plans to release approximately 100 rare archival recordings from the 1960s, supplementing the 50 from the 1950s that already are accessible online. Located at San Francisco State University, the Poetry Center maintains an online events calendar and hosts "what is likely the longest continuously running poetry series" in the United States. I'm a visual integrator. . . I am not an objectifier. . .
about being inspired. . . Everything I need is inside. . . .
American-born but a resident of South Africa since the 1970s, photographer Roger Ballen sees with an uncommon eye. What he shows us in his lens is described frequently as "disturbing", "voyeuristic", "freaky"; rarely is it less than "controversial". He articulately disagrees, explaining that his aesthetic approach is "about defining myself" and "transform[ing] what one might refer to as reality." On what he describes as "fundamentally a psychological and existential journey", Ballen eschews use of color film in favor of black and white, because, he writes in the Introduction on his Website, the latter "does not pretend to mimic the world in a manner similar to the way the human eye might perceive." Ballen is no prettifier. His photographs could not be said to be beautiful in any way that most people define and understand the word. They are filled with unwritten narrative, which few of us would profess to acknowledge as our own; to rise from some dark interior we would be at pains to avoid visiting once, if at all. They are unsettlingly dream-like, surrealistic, outright odd. And they are undeniably riveting. You want to look away from them but instead feel yourself enter them, because you want to understand what it is the images are trying to tell you about the artist, about the subject(s), about yourself as viewer. Asylum of the Birds also is a film, which may be viewed on YouTube in its entirety. In the 10:21-minute video below, Ballen, who has received numerous awards for his photography, music videos, and films, talks with Lens Culture about his work, including the series compiled in his book Boarding House (Phaidon, 2009). I think he's particularly perceptive about himself, his artistic vision, and his approach to documenting the world as he sees and transforms it. He doesn't seem to be concerned with what we think, a perspective I find enormously refreshing and self-assured. A list of exhibition venues where Ballen's work will be appearing this year and in 2015 is found in the Exhibitions section of his Website. His work is found in many museum collections in the United States and abroad, including Berkeley Art Museum in California, Centre Georges Pompidu in Paris, Haifa Museum of Art in Israel, and Tate Britain in the London. 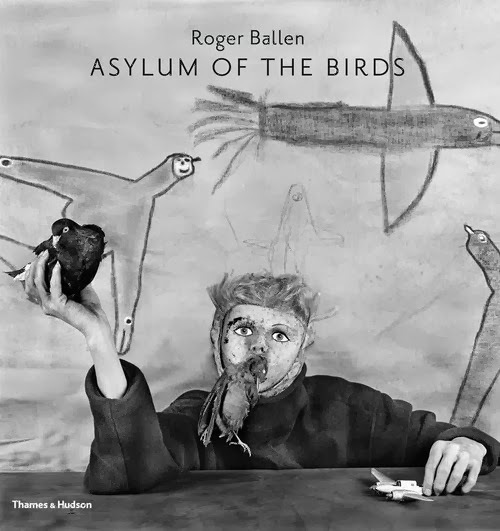 Ballen recently was the subject of the posts "Inside Roger Ballen's Mind: A Place of Refuge and Madness", at the Lens blog of The New York Times (James Estrin, March 11, 2014), and "Roger Ballen: 'in a microsecond you create infinity'" at The Telegraph (Lucy Davies, March 8, 2014). Ballen has established a foundation that seeks to advance education in photography in South Africa. the scale of it. . . .
bare legs and unshod feet. Look again at the pictures. of a mountain of volcanic rock. What we can imagine is no aberration. A poet enchants for the purpose of disenchanting. Quoted from John Betjeman's poem "Loneliness". Today's short is a teaser for A Life With Asperger's, an animated documentary about the challenges of living with Asperger's syndrome. Directed by Jaime Ekkens, the four-minute film, which received the "Best Animation" award from the Los Angeles Cinema Festival of Hollywood, most recently was screened at the February 2014 DC Independent Film Festival and the March 2014 ReelAbilities: NY Disabilities Film Festival. Ekkens talks about her work in a video interview at the 2013 Raindance Festival. 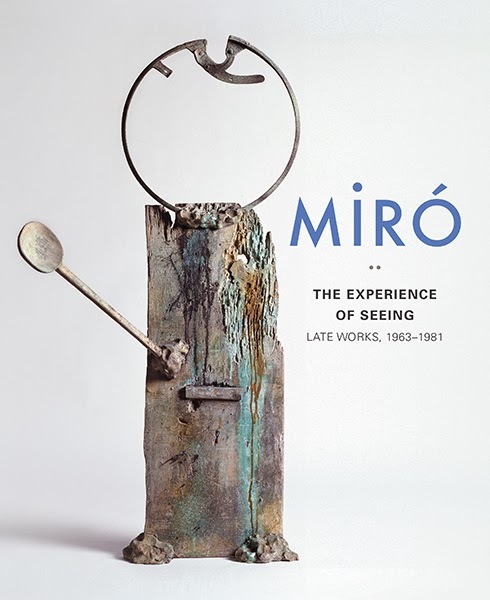 ✦ Yale University Press has issued Miro: The Experience of Seeing — Late Works, 1963-1981, comprising color illustrations of almost 50 paintings, drawings, and sculptures, in addition to essays by Carmen Fernandez Aparicio, chief curator of sculpture at Museo Nacional Centro de Arte Reina Sofia in Madrid; Charles Palermo, a professor of art and art history at the College of William and Mary in Virginia; and Pere Portabella, a Spanish film director, producer, and politician. The publication accompanies the exhibition of the same name, which is currently at Seattle Art Museum and is scheduled to travel to The Nasher Museum of Art and Denver Art Museum. ✦ Public spaces will be transformed into free, open-air galleries of American masterworks, beginning August 4, thanks to the National Gallery of Art and the Outdoor Advertising Association of America. To help NGA and OAAA select the 50 masterpieces that will appear on as many as 50,000 displays around the country, visit Art Everywhere and cast your vote. ✦ Thanks to The Phillips Collection, you can now design your own exhibition of American art using uCreate and paintings and sculpture from the museum's "Made in the USA" exhibition, on view through August 31. Read "Be the Curator with uCurate" at The Experiment Station blog. The virtual gallery tool works for Windows- and Apple-based computers. Beta testers are wanted to test the mobile version. ✦ I was unfamiliar with the work of French coal miner-turned painter Augustin Lesage (1876-1954) until the post "Augustin Lesage's Art" appeared at Art is a Way. The embellishment of Lesage's huge canvases is extraordinary. Considered an "outsider artist", Lesage made more than 200 paintings populated with mythical figures and symbols and repetitive patterns. Watch a video about him (in French); his backstory is fascinating. ✦ Britta Berg's fiber art is terrific. Her moss brushes look like skirts and dresses, depending on how they're oriented for view. See her work on Flickr and in her Etsy shop. In addition to decorative objects for the home, the Swedish artist also makes textile brooches, necklaces, and scarves and shawls. ✦ Valeria Nascimento (another wonderful find by my friend Hannah Stephenson) creates exquisite ceramics. I'm particularly taken with her porcelain Bamboo Installation, Pods, and Pods Triptych, all of which may be seen at Woolff Gallery and on Nascimento's Website. ✦ Eric Standley, an artist who teaches at the School of Visual Arts at Virginia Tech, Blacksburg, Virginia, and has achieved international renown, creates some of the most intricate, multi-layered cut-paper sculptures I've ever seen. His most recent exhibition, "CUT: Window to Eternity", was at Marta Hewett Gallery, Cincinnati, Ohio; a 106-page catalogue is available. His work Either/Or Newmarch is part of the group show "new waves 2014" on display through April 27 at Virginia Museum of Contemporary Art. Watch the video "Virginia Tech: Eric Standley" on Vimeo. 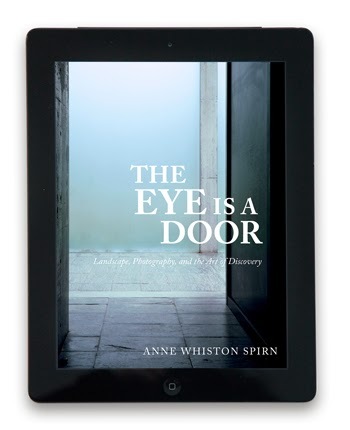 ✭ Smith College Museum of Art, in Northampton, Massachusetts, is presenting "The Eye is a Door: Landscape Photographs by Anne Whiston Spirn". (Spirn is a professor of landscape architecture and planning at MIT, a photographer, a landscape architect, and the author of a number of books, including Daring to Look: Dorothea Lange's Photographs and Reports from the Field.) An introduction to the Smith College exhibition, which continues through August 31; image highlights, and an exhibition brochure (pdf) are provided online via the exhibition link above. ✭ Teresa Hubbard's and Alexander Birchler's Sound Speed Marker continues through July 31 at Ballroom Marfa, Marfa, Texas. The exhibition comprises the artists' video installations Grand Paris Texas (2009), Movie Mountain (Melies) (2011), and Giant (2014), as well as related photographs. A catalogue is scheduled to be published at the end of this year. The exhibition will travel to Irish Museum of Modern Art (December 2014) and Blaffer Art Museum, University of Houston (May 2015). 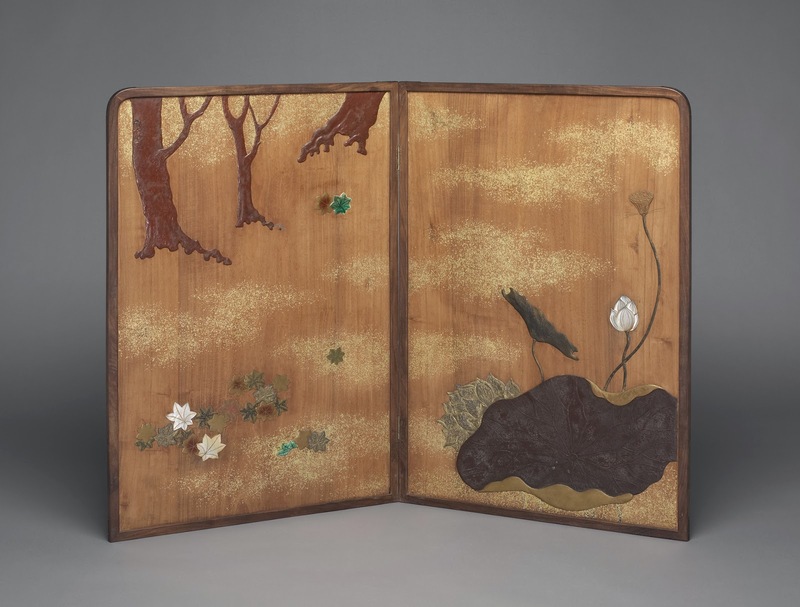 ✭ Japanese folding screens (byobu) from the mid-16th Century to early 21st Century are on view in "Byobu: The Grandeur of Japanese Screens", continuing through July 6 at Yale University Art Gallery. Showcasing screens from the gallery's own collection, as well screens on loan from private collections, the exhibition comprises three successive installations, each of which is focused on a diferent aspect of Japanese screen tradition. The first installation, "Tales and Poems in Byobu", concluded March 23 (see exhibition checklist). The other two are "Brush and Ink in Byobu", running through May 11 (see exhibition checklist), and "Nature and Celebration in Byobu" (see exhibition checklist), concluding July 6. Additional details are found at the exhibition link above. Also see Selected Exhibition Images. 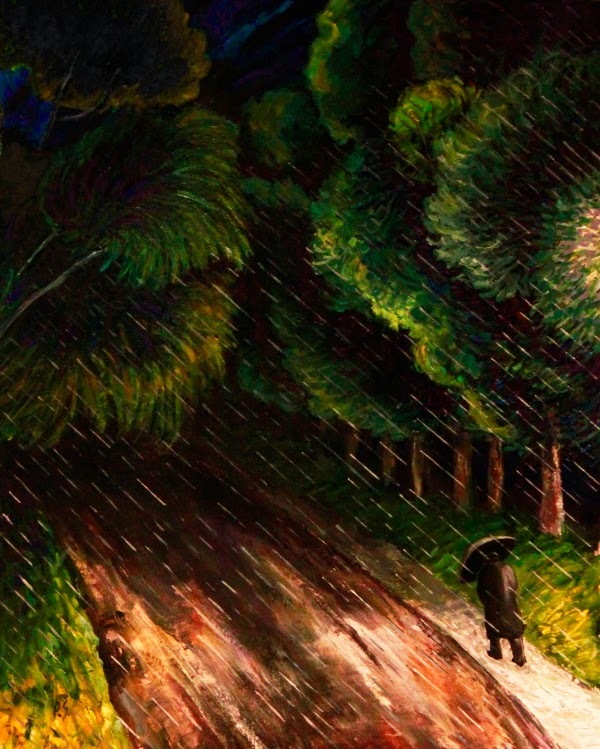 ✭ New York City's Poets House opens "A Painter and His Poets: The Art of George Schneeman" on April 22. The exhibition, on view through September 20, is described as "the first major retrospective of [the late] George Schneeman's collaborative paintings, collages, prints, and books, spanning 40 years of his work and including many portraits of his poet friends." A panel discussion and poetry reading with Bill Berkson, Michael Brownstein, Larry Fagin, Alice Notley, Maureen Owen, Ron Padgett, Harris Schiff, Peter Schjeldah, Anne Waldman, and Lewis Warsh is scheduled for April 26, 3:00 p.m. - 6:00 p.m.
✭ In Paris, the Grand Palais is host to the exhibition "Bill Viola", which presents a wide range of the celebrated video artist's works, including "moving paintings" and monumental installations. The show, which runs through July 21, covers the period 1977 to the present. It was organized in collaboration with Bill Viola Studio. ✭ London's Tate Britain is taking a look at the uses of ruins in art from the 17th Century to today in "Ruin Lust", continuing through May 18. The exhibition includes more than 100 works by J.M.W. Turner, John Constable, John Martin, Eduardo Paolozzi, Rachel Whiteread, Tacita Dean, Keith Arnatt, John Latham, Graham Sutherland, Paul Nash, and others. A catalogue accompanies the show. Oil on Canvas, 28" x 22"
Please join me today at Escape Into Life, where I've posted a new Artist Watch feature. I'm delighted to present the oil paintings of Paul Sierra. Recognized as one of the foremost contemporary artists from Cuba (Sierra was born in Havana in 1944), Sierra occupies a land of myth and symbol in which he depicts in lush and vibrant colors otherwordly landscapes, self-portraits, and interiors. See images of Sierra's fascinating work, replete with narrative possibilities, learn about his background and training as an artist, and find out where his work is on view — all at Artist Watch. Today's post provides an introduction to Jaroslav Malina: Master of Dramatic Space, a documentary on renowned stage designer Jaroslav Malina from Dutch filmmaker Hans van Seventer. The 41-minute film, which examines Malina's life and career in theatre and, in particular, the obstacles and pressures and lack of personal and artistic freedoms under nazism and communism, was named Best International Short Documentary at the 2011 Garden State Film Festival. Malina, born in 1937 in Prague, in the former Czechoslovakia, is known for "action design", an approach to theatre production that takes into consideration the creation and use of sets, costumes, and lighting as well as actors' performance text. Malina has designed more than 450 sets and costumes for theatre, film, and television. His set designs, paintings (showing influences of constructivism, the French style of abstraction known as tachisme, and Art Brut), graphics, and posters have been shown in more than two dozen solo exhibitions. His work is in several museums in the United States, including Theatre Research Institute at The Ohio State University and Museum of Performance & Design (Performing Arts Library & Museum) in San Francisco, California. The trailer also is available on Vimeo. The documentary (some details are here) is available on DVD. My thanks to Artist on Film for the link to the documentary's trailer. this fact and that truth. On Wednesday, April 23, the Poetry and Literature Center at the Library of Congress will hold the second conversation in its 2014 series "The Life of a Poet". The event will be a discussion between The Washington Post's Ron Charles and Edward Hirsch. The interview will take place at 7:00 p.m. at Hill Center, at the Old Naval Hospital, 921 Pennsylvania Ave., S.E., Washington, D.C. Hill Center co-sponsors the series with the LOC. Reservations are required for the talk (seating is limited to 100), which is free and open to anyone. Edward Hirsch is the author, most recently, of The Living Fire: New and Selected Poems (Knopf, reprint, 2011), Special Orders: Poems (Knopf, 2009), and On Love: Poems (Knopf, 2008). In addition to other published volumes of poetry, Hirsch has written How to Read a Poem: And Fall in Love with Poetry (Mariner Books, 2000) and Poet's Choice (Mariner Books, 2007), a collection gathered from his Washington Post Book World columns of the same title. Charles once edited the column. ✦ Mary Szybist, Wednesday, September 17. Szybist, associate professor of English at Lewis & Clark College, is the winner of the 2013 National Book Award for Poetry, for Incarnadine (Graywolf Press). Read an interview with Szybist at National Book Foundation; see a Webcast of Szybist's 2009 Witter Bynner Fellowship reading. ✦ August Kleinzahler, Tuesday, November 4. A 2008 National Books Critics Circle Award winner, for Sleeping It Off in Rapid City (Farrar, Straus and Giroux, 2009), Kleinzahler has published 11 poetry collections, including, most recently, The Hotel Oneira: Poems (Farrar, Straus and Giroux, 2013). The first event in the program, held February 6, was a conversation with Carl Phillips, who has written a dozen poetry collections, among them, Silverchest (Farrar, Straus and Giroux, 2013) and Double Shadow (Farrar, Straus and Giroux, 2012), awarded a Los Angeles Times Book Prize. His The Rest of Love (Farrar, Straus and Giroux) was a 2004 National Book Award finalist. The talk was videotaped and is available on YouTube: "Hill Center Poetry Series: The Life of a Poet - A Conversation with Carl Phillips" (1:00:27 minutes). ✭ The Poetry of America Website, where you'll find two features: "Poetry of American Identity", a collection of recordings in which poets read and talk about a poem of choice; and "Poetry of American History", comprising essays and interviews. Participating in the former are poets Fanny Howe, Naomi Shihab Nye, Tony Hoagland, J.D. McClatchy, Nikky Finney, Amy Gerstler, Gerald Stern, Marilyn Chin, Laura Kasischke, Arthur Sze, Sharon Olds, Rhina P. Espaillat, Dana Gioia, Alicia Ostriker, Charles Harper Webb, Edward Hirsch, Rae Armantrout, Charles Bernstein, and Marilyn Nelson. 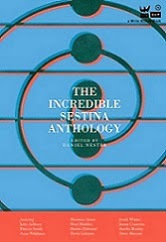 The latter features the late Maxine Kumin, Donald Hall, Ted Kooser, and David Lehman. ✭ Interview Series, featuring conversations with contemporary writers and poets Cynthia Y. Levinson, Paisley Rekdal, Karen Russell, Aracellis Girmay, Justin Torres, and Joshua Beckman.
. . . Ultimately, literature is nothing but carpentry. Today's beautiful short is A Solitary World (PBS Digital Studios), inspired by works by H.G. Wells (1866-1946). Director and producer James W. Griffiths, a 2014 BAFTA winner (for Room 8), adapted text from Wells's The Time Machine, The Island of Dr. Moreau, The First Men in the Moon, In the Days of the Comet, and The World Set Free. Narration is by Terry Burns. The score is by the remarkably talented Lennert Busch. ✦ Celebrate Slow Art Day tomorrow, April 12. A list of venues is found at the link. ✦ I first saw the gorgeous work of Danish ceramist Jane Reumert at Art Is a Way. Her porcelains, some salt-glazed and comprising a mix of porcelain clay and fibre glass, are unforgettable. See a selection of images at Nationalmuseum (Stockholm), Strandstraede Keramik, LaCoste Gallery, and An Eclectic Eccentric blog. Reumert's pieces are in the collections of the Metropolitan Museum of Art, Nationalmuseum, Palmer Museum of Art, and other public and private institutions. ✦ In the online archives of Crown Point Press at Magical-Secrets, a site devoted to the creative process, numerous videos are available of artists talking about artmaking and printmaking. Links to biographies of press artists are found on the same page: Crown Point Press Artists. ✦ The video below is from The Phillips Collection, where visitors may view through May 4 Jean Meisel's 50-65 Horizon Line, an installation for the museum's wonderful, ongoing Intersections project. Listen as Meisel, who lives and works in the Washington, D.C., area, discusses her piece, which comprises more than 50 small watercolors of horizon lines. ✦ In the video below, Ellen Gallagher talks with Art21 about her paper cutouts. Last year, Gallagher exhibited in "Ellen Gallagherr: Don't Axe Me" at New York City's New Museum. She has solo shows this year at Hauser & Wirth in London and at Hause der Kunst in Munich. ✭ New York City's Swiss Institute/Contemporary Art is presenting through May 11 the work of Swiss artist Heidi Bucher (1926-1993). Included are a selection of Bucher's significant works, among them, Herrenzimmer (1977-1979), Grande Albergo Brissago (Eingangsportal) (1987), and Jetze Fliesst das Wasser aus der Vase (1986); screenings of audiovisual documentation, such as images of the wearable sculpture Bodyshells (see video) and archival materials on view for the first time. The exhibition is the first in the United States in more than four decades. Images can be found at the exhibition link and in the article cited below. ✭ Continuing through June 15 at Fuller Craft Museum, Brockton, Massachusetts: "The Stories We Tell: Works by Tommy Simpson, Michelle Holzapfel and Binh Pho". This is a multimedia exhibition that showcases furniture, vessels, sculpture, painted reliefs, ceramics, and textile designs by the three internationally known artists whose works convey thematic narratives involving nature, history, and whimsy. ✭ Engravings of Captain James Cook's voyages to the Pacific Islands and South America are on view through July 13 in "Terrestrial Paradises: Imagery from The Voyages of Captain James Cook" at Lowe Art Museum, University of Miami, Coral Gables, Florida. The engravings are from George William Anderson's A New Authentic and Complete Account of Voyages Round the World (1874-1786). ✭ "Mother Earth, Father Sky: Textiles from the Navajo World", at Missouri's Saint Louis Art Museum, presents 14 historic and contemporary textiles — blankets, serapes, saddleblankets, sandpainting weavings — including a new acquisition by D.Y. Begay and loans from the Museum of Native American History in Bentonville, Arkansas. The exhibition runs through June 22. See Begay's process at her Website. ✭ More than 150 works from the National Museum of Korea and public and private collections may be seen through May 26 at Philadelphia Museum of Art (a trailer for the exhibition is below). "Treasures from Korea: Arts and Culture of the Joseon Dynasty, 1392-1910" showcases painted screens, scrolls, calligraphy, costumes, furnishings, ritual ware, illustrated books, photographs, metalwork, and accessories. The exhibition is organized around five themes that offer insights into the royal court's role in establishing art and culture in Korea, the taste for simplicity, hierarchies and social distinctions of class and gender, ancestral worship, rise and suppression of Buddhism, and encounters with Western civilization. An illustrated scholarly catalogue accompanies the exhibition, which will travel to Los Angeles County Museum of Art on June 29 and to the Museum of Fine Arts, Houston on November 2. Writer and poet L.L. Barkat is blessed with a talent for metaphor, an eye for the spare image that can shimmer like a polished gem, and a sensuous and lyrical voice — gifts she uses beautifully, even profoundly, in her focused new collection of poetry, Love, Etc. (T.S. Poetry Press, March 17, 2014). With an enviable economy of words — a trademark — Barkat shows and never, or almost never, tells. 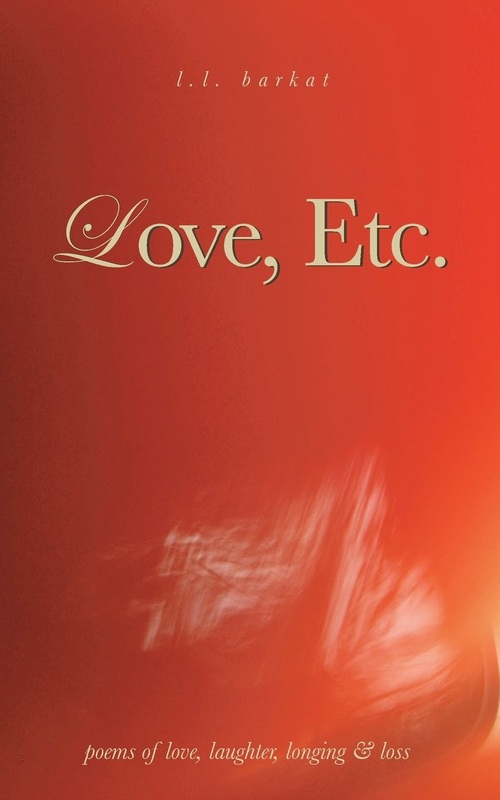 For her, love is a fully lived experience — replete with the "Etc." that is by turns playful, suggestive of what could be, mysterious, wistful, carnal, eternal. It is bound complexly in romance, family, and friendship; colored as much by humor and laughter as by hurt and loss. It arises in the still watchfulness of a parent beside a child's bed "on breath-thin nights" ("Ours"); in the long empty space between an open and a closed parenthesis ("Meet Me in a Minimalist Poem Where We Can Wear") — a clever riposte to academy poets and a marvelous metaphor for what always can be left unsaid; in the lines of the hands ("Whispered"); in the acceptance of "a hot kiss of clove and cinnamon" ("Choice"); in the shattering of a glass bangle ("Rabia's Confession") or the sleep that comes before and after ("Fantasy"). No one poem can stand for a single definition of "love", and that is the point. Love needs space, it needs time, it needs (sometimes) an "open mouth" and a "full spoon" of soup ("Spanish Recipe"). It wants a delicate and knowing touch, sure and never forced diction, inspiration and imagination. Above all, it wants the "proof" of a poem, which Barkat delivers in this collection in as many ways as her "untie[d] tongue" and "tiger-eyed" glances can provide. I love them, you know. All your little beaded words. red glass (with the foil inside). wood ones all carved and oblong. all through their crystal chattering. Read Love, Etc. all at once, section-by-section, one poem a day, before you say goodnight; but read and return to it often. It rewards and gives back by settling in deep. And come Valentine's Day, don't forget to tuck a copy of Love, Etc., under the pillow of your lover. You won't need any other words than those in this slim, red-covered volume. It will make its own spark and leave it up to you keep the fire burning. L.L. Barkat is the author of six books, including the poetry collection InsideOut (International Arts Movement, 2009), the experimental fiction and poetry titled The Novelist: A Novella (T.S. Poetry Press, 2012), and Rumors of Water: Thoughts on Creativity & Writing (T.S. Poetry Press, 2011). Barkat's poems have appeared at VerseWrights, Best American Poetry, Virginia Quarterly Review, and Every Day Poems. The managing editor of TweetSpeak Poetry, Barkat also is a staff writer for The Curator magazine. Love, Etc. is available in paperback and as an e-book for Kindle and Nook. I'm pleased to share this recently released videopoem by John Siddique: "Whirlpool". Filmed in Hedben Bridge, England, "Whirlpool" is written and spoken by Siddique. The poem appears in the Spring 2014 issue of The Interpreter's House. and ambitions supple and impudent. the flowering Judas poking at the door. This poem is from a manuscript-in-progress, tentatively titled "The Found Poems of T.S. Eliot"; the individual words are all found in the text of Eliot's poem "Gerontion". Today's post is another in an occasional series offering something about poets and poetry, or writing more generally, that you might not know. ✦ The late poet Maxine Kumin (1925-2014) was one of the first two women hired by the Department of English at Tufts University, where she was an instructor and, later, lecturer in English. State poet of New Hampshire from 1989 to 1994 and Poet Laureate Consultant in Poetry to the Library of Congress from 1981 to 1982, Kumin also resigned from the Academy of American Poets' Board of Chancellors, pointing out that there were too few women and minorities in positions of leadership. Of her Radcliffe writing instructor Wallace Stegner, Kumin admitted being "turned off" to poetry after Stegner said to her, "Say it with flowers but for God's sake don't write poems about it." (2002 Atlantic Interview) She added that she forgave Stegner his blunder. ✦ John Reed has used rather uncommon readers of his sonnets: pornstars, Webcam models, and, most recently, avatars. You'll find videos of the avatar readers at the link below. ✦ Moleskin knows not every poet sticks to old-school pen and paper or hard-cover pocket notebooks. For the digital poets among us, the company offers both a smartphone cover and a tablet/iPad-compatible cover that combine with blank notebook pages. Write on! 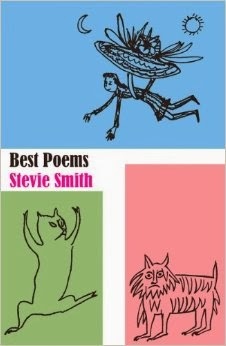 ✦ The volume titled Best Poems of Stevie Smith (New Directions) was published in December 2013. The English poet and novelist (1902-1971) has been described as a "cartoon-drawing, school-girl-dress-wearing, near doggeral-spouting" poet who "ranks among the silliest...." No need to say more. Hear Stevie Smith reciting her poem "Not Waving (But Drowning)" in this video.